For other uses, see Herne Hill (disambiguation). In Rocque's 1746 map, the area is shown as "Island Green", probably reflecting the presence of the River Effra and smaller tributaries. Early references to the area also use the form "Ireland Green". The first documented reference to the name "Herne Hill" that can be dated with certainty is in a map by the topographer James Edwards published in 1800, where it appears as "Hearn Hill". This map shows the very first houses built on the hill. A map showing the Herne Hill ward of Lambeth Metropolitan Borough as it appeared in 1916. Herne Hill was transformed by the arrival of the railways in 1862. Cheap and convenient access to London Victoria, the City of London, Kent and south-west London created demand for middle-class housing; the terraced streets that now characterise the area were constructed in the decades after the opening of Herne Hill station and the old estates were entirely built over. During the early morning of 7 August 2013, an 88‑year‑old 0.9 m diameter water main on Half Moon Lane burst, flooding Herne Hill, Dulwich Road and Norwood Road along with 36 properties (including the Half Moon public house) to create a scene described as "biblical" by local residents. Thames Water admitted liability and estimated the total cost of the damage to be around £4 million. The Half Moon remains closed, but there has been a vigorous local campaign for it to be reopened as a pub; Southwark Council have declared it an asset of community value. 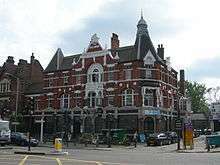 Herne Hill is situated between the areas of Brixton, Dulwich Village and Camberwell. It also straddles two boroughs, and is a community of just under 12,000 people, with a range of independent shops, art galleries, bars and restaurants. The Southwark half of Herne Hill is part of what is now called the North Dulwich Triangle. Famous Herne Hill residents from history include John Ruskin and the Lupino family, and actor Roddy McDowall was born there. The area is home to the 50.8 ha (125.5 acres) Brockwell Park. Near a hilltop in Brockwell Park stands the Grade II* listed Brockwell Hall, which was built in 1831. The hall and the land surrounding it were opened to the public in 1891 after being purchased by London County Council. Brockwell Park hosts the annual Lambeth Country Show and was the site of London's Gay Pride festival for several years in the 1990s. The park also houses Brockwell Lido, a 1937 open-air swimming-pool that faces on to Dulwich Road. Herne Hill railway station on Railton Road was opened by the London, Chatham and Dover Railway in 1862; the Gothic, polychrome brick station building was Grade II listed in 1998. The associated railway viaduct and bridges are also noteworthy; The Building News stated in 1863 that the viaduct was "one of the most ornamental pieces of work we have ever seen attempted on a railway" for its fine brickwork. The Herne Hill Velodrome, situated in a park off Burbage Road, was built in 1891 and hosted the track cycling events in the 1948 Summer Olympics. Unlike most modern, steeply-banked velodromes, it is a shallow concrete bowl; the 'Save the Herne Hill Velodrome' campaign is seeking a way to secure the future of the site. The same park also has a football pitch and was the home of Crystal Palace F.C. from 1915 until 1918. A Blue Plaque at 84 Burbage Road marks the former home of the athletics coach Sam Mussabini. Mussabini was later immortalised in the film Chariots of Fire, in which he was played by actor Ian Holm. In 1894, Mussabini was appointed coach to the Dunlop cycling team which trained at the Herne Hill Velodrome. In 1913, Mussabini was appointed coach to the Polytechnic Harriers at the Herne Hill athletics track, which ran round the inside of the Velodrome cycle track. Here he trained athletes, including the fourteen-year-old Harold Abrahams. The Half Moon Public House on Half Moon Lane was built in 1896 (although a tavern has existed on the site since at the 17th century) and was Grade II* listed in 1998. The pub hosted a boxing gym for more than 50 years. The Church of St Paul on Herne Hill was originally built by G Alexander in 1843 at a cost of £4,958, but dramatically rebuilt by Gothic architect G E Street in 1858 after a destructive fire. It is now Grade II* listed. The lake in Sunray Gardens (at the junction of Elmwood Road and Red Post Hill) was originally the fish pond in Casino House (a large estate established in 1796/97, now demolished); the adjoining Casino Estate still bears the house's name. The Carnegie Public Library on the road now named Herne Hill Road opened in 1906 after a Lambeth Librarian got a grant from Andrew Carnegie for building a library within the Herne Hill area. It is also a listed Grade II building. A Blue Plaque at 51 Herne Hill (by the junction with Danecroft Road) marks the former home of author Sax Rohmer (a.k.a. Arthur Henry Ward), most famous as author of the series of novels featuring the master criminal Dr. Fu Manchu. Ernie Izzard, British lightweight champion boxer, nicknamed "The Herne Hill Hairpin"
Direct rail services are available from Herne Hill railway station to London Blackfriars, Farringdon, St. Pancras International, Luton Airport and London Victoria. Nearby railway stations offer services to other destinations: London Bridge station can be reached from North Dulwich; since December 2012 Denmark Hill has trains to Clapham Junction in south-west London and Highbury and Islington in north-east London via the London Overground's South London Line. The nearest London Underground station is Brixton on the Victoria line. There have been past proposals to extend the Victoria line to Herne Hill station on a large reversing loop. Herne Hill is a London bus zone the routes are 3, 37 (24 hours), 68, 42, 196, 201, 322, 468, school route 690 and night buses N3 and N68. ↑ James Edwards, A Companion from London to Brighthelmston, in Sussex: Consisting of a Set of Topographical Maps from Actual Surveys. Edwards' Companion was published in complete form in 1801, but the relevant map has the publication date 1 March 1800. The descriptive text, which does not mention Herne Hill, refers to the survey being under way in 1789, so it seems that the name appeared at some point between then and 1800, prompted by the need to find a description for the location of the newly built houses. This is consistent with a small sketch by Thomas Girtin (1705–1802), inscribed “Herne Hill” and not dated, but attributed to 1796/7 in D. Girtin and D. Loshak , The Art of Thomas Girtin (London, 1974), the sketch appearing to show a small group of buildings on sloping ground with building materials in the foreground (sketch in the Huntingdon Library, California, object no. 59.55.596). ↑ Herne Hill Society, Herne Hill Heritage Trail (rev. edn, 2013); J. Brunton, A Short History of Herne Hill (Herne Hill Society, 2011). See also A Dictionary of London Place-Names, A. D. Mills, OUP Oxford, 2010, ISBN 9780199566785, probably named from a field called “le Herne” (c.1495), that is "the angle or corner of land" from Anglo Saxon hyrne (cognate with the English word "horn"), with the later addition of “hill”. Alternatively, it may take its name from the family called Herne mentioned in connection with nearby Dulwich from the 17th century (although their surname almost certainly derives from the same, or a similar, early place name). A link to “heron” has also been suggested, the river Effra being once frequented by herons. ↑ "Parishes: Camberwell", British History Online. ↑ Survey of London: volume 26: Lambeth: Southern area, British History Online. 1 2 "Myatt's Fields, Denmark Hill and Herne Hill", British History Online. ↑ "Half Moon public house". National Heritage List for England. English Heritage. Retrieved 18 April 2014. ↑ "V1 & V2 logs SE24 Herne Hill". Retrieved 19 June 2016. ↑ "Herne Hill properties flooded after burst water main". BBC News Online. 7 August 2013. Retrieved 8 November 2013. ↑ Prynn, Jonathan (9 August 2013). "Thames Water's £4m bill for Herne Hill flood after burst water main". London Evening Standard. Retrieved 8 November 2013. ↑ Mike Urban, "Campaign to save the Herne Hill’s Half Moon pub gathers momentum with an ACV application", Brixton Buzz, 27 November 2015. ↑ "Latest on The Half Moon", Herne Hill Society. ↑ Cherry, Bridget; Pevsner, Nikolaus (1983). Buildings of England, London: South, Volume 2. London: Penguin. p. 363. ↑ List entry Number: 1376144, HERNE HILL RAILWAY STATION, ENTRANCE BLOCK ONLY English Heritage. Retrieved 20 April 2012. ↑ "London, Chatham and Dover Railway". The Building News. The Proprietor of the "Building News". 10 (9 January): 27. 1863. ↑ List entry Number: 1385592, HALF MOON PUBLIC HOUSE. English Heritage. Retrieved 28 April 2012. ↑ "Where the pugilists drink", Times Online. Retrieved 28 April 2012. ↑ Calne - Cambourne, British History Online. ↑ List entry Number: 1385599, CHURCH OF ST PAUL, HERNE HILL, English Heritage. Retrieved 28 April 2012. ↑ Myatt's Fields, Denmark Hill and Herne Hill. British History Online. ↑ "Sir James Black: Blue Plaque application for JKPS building". Judith Kerr Primary School. Retrieved 1 November 2016. ↑ Frances Taylor, "'Game of Thrones' casts Joel Fry as Dany's Meereen contact", Digital Spy, 27 September 2013. ↑ Neil Midgley "Cathy Newman: The time I feel the need for plastic surgery is the time that I leave TV", Evening Standard, 6 December 2011. ↑ Buses from Herne Hill (PDF). Transport for London. 2011. Retrieved 20 April 2012. 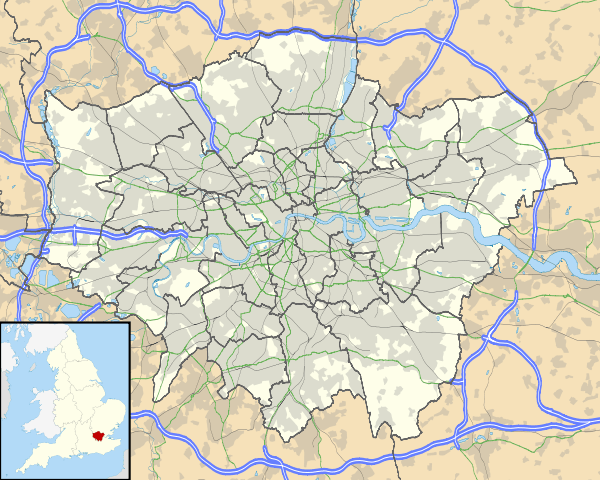 Wikimedia Commons has media related to London SE24. Wikimedia Commons has media related to Herne Hill.